As its elaborate title implies, the 1963 gumshoe-and-gangsters flick, Detective Bureau 2-3: Go to Hell, Bastards! was supposed to kick off a series of films, with Jo Shishido (he of the impossible-to-forget, surgically enhanced chipmunk cheeks) as a private detective operating out of the titular office. One sequel was made (that has never seen U.S. release), but a series never materialized, so all we have stateside is this zippy little (sort-of) standalone. Directed by Seijun Suzuki -- who would bring himself and Shishido international cult fame four short years later, with Branded to Kill -- Go to Hell, Bastards! does not achieve the operatic lunacy of that shared career high point. That doesn't make it any less fun to watch. Shishido plays a private detective named Tajima. When he doesn't have a client, Tajima must get really bored, because he involves himself in a gangland turf war for no clear reason. Two rival gangs have been running black market guns, ripped off of a local U.S. Army base. A third gang swoops in, with their guns blazing, and turns most of the other two gangs to Swiss cheese, before making off with the contraband artillery. Tajima decides to assume a yakuza identity and infiltrate this third gang, with a little help from a gruffly sympathetic police inspector, Kumagai (Nobuo Kaneko). He saves the life of a gang member who is set up to be ambushed, which gives him the necessary entrée into the gang's lair. The gang's underboss likes Tajima's gumption, but he doesn't totally buy his story. Before he lets Tajima in on their gun racket, he has to double-check every aspect of the P.I. 's story. Fortunately, Kumagai continues to pull strings to make Tajima's fake life as a gangster seem real enough to fool the yakuza. Along the way, Tajima falls for Chiaki (Reiko Sassamori), the virginal moll of the gang underboss. Their potential romance is complicated by Tajima's past relationship with nightclub singer, Sally (Naomi Hoshi), who has the ability to spoil everything by blabbing her knowledge of Tajima's true identity. Go to Hell, Bastards! is a formulaic program picture that benefits immeasurably from Shishido's off-kilter charisma and Suzuki's flair for chaotic action staging. The acting is strong across the board, with Kaneko and Sassamori effective as different types of emotional foils to Shishido's cool-as-a-cucumber act. 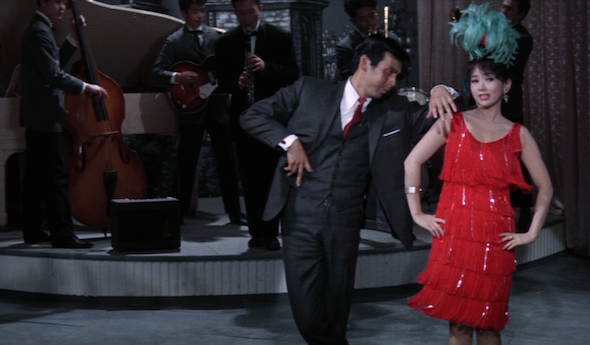 A memorable moment, in which Shishido's character gets on stage and starts singing and dancing to keep Sally from blowing his cover, points toward the kind of genre-bending silliness in which Suzuki was prepping to indulge. He's not quite there yet, but Go to Hell, Bastards! stands on its own as a lean, lithe, and entertaining effort. Detective Bureau 2-3: Go to Hell, Bastards! is packaged with a reversible sleeve, including new art by Matthew Griffin, and a color booklet featuring a liner notes essay by Jasper Sharp. This disc is compatible with both REGIONS A & B. Although listed as having a 2.35:1 aspect ratio, this AVC-encoded transfer actually measures out to 2.45:1. It doesn't look stretched or cropped, so maybe this size is just a fluke of the original anamorphic filming process. Returning now from this nerdy little detour about OAR, it must be said that the transfer on this disc looks outstanding. Rich, saturated colors. Strong contrast and depth. Excellent detail reproduction and nicely resolved film grain. A few minor digital hiccups, but I had to look closely for them. In motion, this flick looks great. A simple Japanese LPCM mono audio track (with optional English subtitles), no complaints. Dialogue is clean and clear. The swingin' musical score is well-supported and sets a nice mood. Gun shots go POW! with satisfying force. Tony Rayns on Detective Bureau 2-3 (HD, 29:01) - Suzuki biographer Rayns discusses the film, mixing reminiscences of the filmmaker with his own feelings toward the film (he seems to think it's a bit dopey, but with glimmers of Suzuki's brilliance-to-come). While this release is a little skimpy on bonuses (especially with that premium Arrow price tag), it stands as a significant A/V quality bump up from the old R1 DVD release. The flick itself is a fun bit of idiosyncratic pulp, from the team that would later bring the world Branded to Kill. If you like your shoot-'em-ups just a little off-center, this disc comes Recommended.